Atheism has been a grossly misunderstood subject for centuries but in recent years more and more people are beginning to open up to the concept. Thus, there has been a significant rise in the number of atheists across the world in the last few years. However, many more continue to malign atheism wrongfully and this is rather unfair because atheism is nothing but the mere rejection of belief in the existence of gods. That is why, Atheist Republic has introduced a whole range of inspirational atheist t-shirts that will help non-believers to spread awareness about atheism among those who do not know much about it and allow atheists to flaunt their faith, or the lack of it publicly! These t-shirts serve as a passive way to introduce believers to atheism as they usually treat the subject with a lot of hostility. Once you succeed in invoking some curiosity about atheism and related ideas, you can take the discussion to great lengths and perhaps convince them to follow it even! 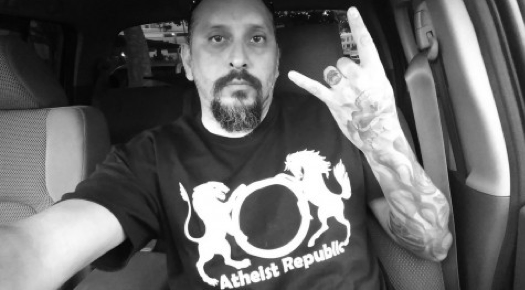 As you can already see, the t-shirts at Atheist Republic have trendy designs and so you are likely to emerge as a trendsetter, especially because not many people wear them already. While you up your fashion quotient and stand out in the crowd by wearing our inspirational atheist tees, let’s hope those around you either feel encouraged to stand up and do the same or feel more aware so they stop stigmatizing people who identify as non-believers. Buy yourself these t-shirts or pick some for your friends. In fact, you can present one to someone who isn’t a non-believer even and that could serve as a starting point for something new and truly refreshing! Choose from our wide range of designs and feel free to customize what you like with your preferred fonts and colours.